What’s on your wish list this holiday season? 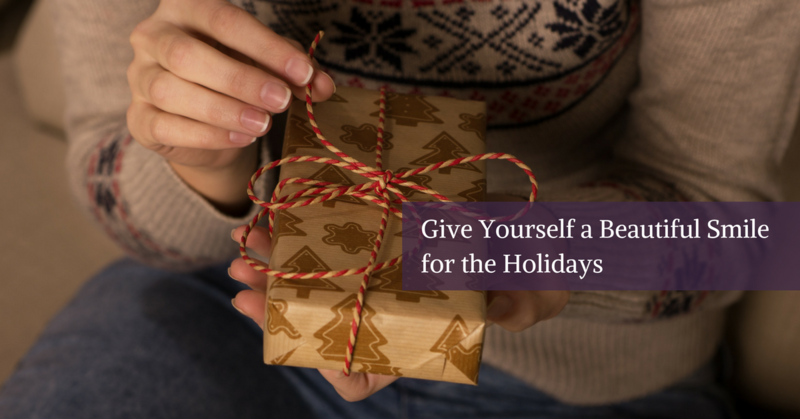 Why not give yourself the gift of a brighter or more beautiful smile? If you’re not happy with your smile, contact a cosmetic dentist to help. Through cosmetic dentistry options, including whitening, veneers and implants, they can help give you the best present of your life – a stunning smile! Cosmetic dentistry is more popular than ever, with more and more people looking for ways to improve or restore the appearance of their smiles. According to the American Academy of Cosmetic Dentistry, 99.7% of adults view a smile as an important social asset, and 74% say that an unattractive smile can limit career success. 1. Whitening: Whiter, brighter teeth can give you more confidence and make you look more beautiful, especially during the holidays with Christmas parties to attend and family pictures to take. A cosmetic dentist can customize whitening agents just for you, to achieve the specific shade that will make your teeth the most brilliant and beautiful. The best results are typically achieved through in-office professional whitening treatment, but dentists offer take-home teeth-whitening systems that are simple, reliable and effective for home teeth whitening. These prescription-strength, take-home teeth whitening gels offer a powerful smile-whitening solution that’s easy to use and creates a beautiful result. 2. Veneers: As a great, long-term restorative option in cosmetic dentistry, dental veneers have become incredibly popular for patients who have an issue with the color, condition, shape or size of their teeth. Dental veneers are thin, custom-fitted and hand-crafted coverings that are made from durable porcelain and are color-selected and hand-shaped to match your teeth. After dental veneers are fitted and bonded onto your existing teeth, your smile will look amazing. Dental veneers are made from nearly indelible porcelain, so they are almost as durable as real tooth enamel and are highly resistant to staining or discoloring over time. No matter what procedure is on your dental wish list, James Otten Dentistry, top cosmetic dentist provider in Lawrence, offers a variety of cosmetic dental services to help give you a more beautiful smile. Here at James Otten Dentistry, we are dedicated to helping you find the right treatment option for your needs, and we’ll give you the information you need to make the most informed decision about your cosmetic dental needs. Our number one goal is to give you the smile that you’ve always wanted. As the top cosmetic dentist provider in Lawrence, our extensive knowledge of cosmetic dentistry enables us to provide a world-class level of care to our patients. Contact the office of Dr. James Otten, top cosmetic dentist provider in Lawrence, at 785.843.6404 for more information or to set up a consultation, or simply fill out the form to request an appointment. James Otten Dentistry would love to help give you the gift of a more beautiful smile!